Sometimes a simple piece of candy can zoom you back to childhood in an instant. 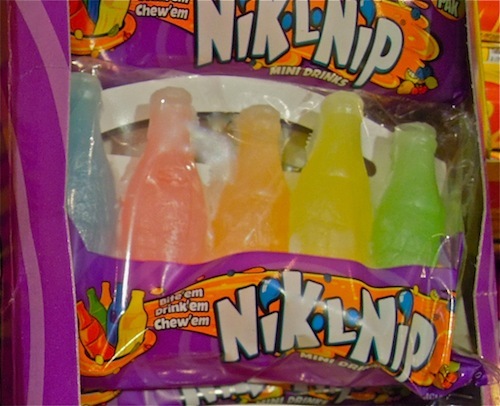 On a recent visit to Powell’s Sweet Shoppe, researching a Valentine’s piece for Bay Area Bites, I spied something among the vintage candies I had completely forgotten existed: Nik-L-Nip wax bottles filled with colored syrups. All of a sudden, I could feel the sticky waxy glob I would bite off to get the sugary juice and hear my mother’s voice warning, “Don’t eat that. It’ll make you sick!” Sneaking forbidden temptations may hold a universal allure harking back to the apple in Eden. Here is a place you can tap into the appeal of the long-ago-forbidden in a Valentine’s Day gift for your sweetie (or even yourself). Instead of arming Cupid’s bow with an arrow dipped in the latest chocolate-cayenne-goji berry-sea salt-caramel to woo your sweetheart, aim for your honey’s inner child with a retro sugar rush from Powell’s Sweet Shoppe in Berkeley (or other Bay Area locations). The Valentine table is carpeted in conversation hearts—speaking dialects from Disney princess to Sponge Bob Square Pants—plus a blanket of red and pink jelly beans and cupid corn, valentine Dots, kiss me mints, chocolate covered marshmallow hearts and XOXO lollipops. It’s easy to get lost in a sugar-coated trip down memory lane browsing the College Avenue shop’s collection of 6000 classic candies in varieties that date from the 20s to the 80s. The real fun starts with a perusal of the bags and bars on the nostalgia table that run from Abba-Zabba’s to Zotz. “This is where childhood memories are reawakened,” says Shahrazad Junblat, co-owner of the shop with her sister and brother-in-law. “I always hear customers exclaim, ‘Oh my God, I haven’t seen this since I was 5,’ or ‘ Grandma always used to buy me this.’” The vintage treats include: Look!, Big Hunk, Moon Pie, Sugar Babies, pastel button dots on strips of paper, Turkish taffy and Nik-L-Nip wax bottles filled with sweet syrup. For the sweetest history lesson ever, check out the Candy by the Decade chart on Powell’s website. Did you know that Bit-O-Honey, Butterfinger, Charleston Chew and Jujubees go way back to the early 1900s? If you are a 50s Boomer, you’ll remember Fizzies, Pixy Stix, and Hot Tamales. Flower Child of the 60s? Fruit Stripe gum, Twizzlers and Lemonheads should ring a bell. Wore Jordache Jeans in the 70s? Pop Rocks and Ring Pops came out in your decade. Played Pac Man in 80s? Maybe while chomping Runts and Nerds. (If you are wondering about the “ethnic” angle to this post, it’s in Powell’s imported candies from around the world, coming up here). Junblat left the corporate world after 20+ years to cheerfully preside over “this happy place.” She personally favors the British imports, including Cadbury bars, Rountree’s Fruit Gums and Aero bubble chocolate, aptly housed in a red British phone booth. Additional foreign imports satisfy both world travelers and expats, such as Australian Kookabura licorice and Violet Crumble bars. Famous Dutch licorice is represented by licorice coins, hard licorice buttons, and salty salmiak rocks. Gummis range from butterflies, penguins and mice to khaki green army guys and even sunnyside up eggs. Asked for the latest trend in candy, Junblat quickly replies, “Bacon is the new black.” And points to a table with bacon flavored floss, toothpaste, chocolate, fizzy drinks and lollipops. Some sweets perform a double duty, like candy beaded necklaces and Melody pops that play a tune. All manner of jawbreakers sit in jars, from teensy marbles to huge orbs the size of a baby’s head. Aaron Lindstrom, shift manager, admits to keeping a gigantic jawbreaker hidden in a paper bag under his bed when he was in the third grade. He secretly worked on it for months until it was gone. Powell’s most helpful website also lists candies for those with dietary restrictions and preferences. It’s nice to know that vegans can still enjoy Swedish Fish, Chick-O-Sticks, Hot Tamales and Boston Baked Beans. There’s a large number of gluten-free goodies too. I noticed that the list of candies without high fructose corn syrup includes Gummi Brains, Banana Heads and Smarties. Does this somehow indicate that people who avoid the stuff are more intelligent? Do you have a story about your favorite childhood candy? 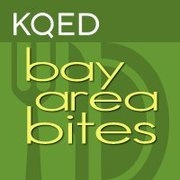 This entry was posted in Uncategorized and tagged abba zabba, bacon flavored candy, Berkeley, candy, candy store, classic candies, conversation hearts, Powell's Sweet Shoppe, Valentine's Day, vintage candy. Bookmark the permalink.